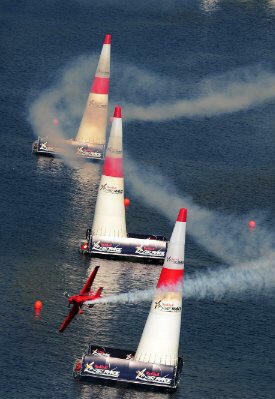 May 26, 2010 - As the Red Bull Air Race World Championship prepares to land in the Canadian city of Windsor, Ontario on June 5 and 6th for the fourth round of 2010 season, all eyes are on the widening field of title contenders. In the most closely fought battle in the sport’s history, at least five teams are in the running, including local hero Pete McLeod, the youngest pilot in the championship. The Canadian, who currently sits in 5th place, is looking forward to his home race over the Detroit River after dazzling the crowd of 300,000 last year as a rookie with a brilliant performance under pressure. Britain’s Paul Bonhomme, on 31 points, is clinging to a shrinking lead at the top of a pack of challengers that includes compatriot Nigel Lamb (28 points), Austria’s Hannes Arch (27 points), Australia’s Matt Hall (22 points) and Pete McLeod (19 points). Bonhomme, who turned his flagging 2009 season around with a victory in Windsor, will be looking for the same to happen this year after back-to-back third place finishes at the last two races in Perth and Rio de Janeiro. “It is most definitely a three horse race…or possibly four?” said Bonhomme. McLeod has happy memories from last year’s race in Windsor, where despite competing in a relatively slow and heavy plane, got his season-best result to the delight of the home crowd. It was an impressive performance by McLeod on a race track over the Detroit River made challenging by changing winds. McLeod, who has gained the respect of veteran pilots with his flying prowess on difficult tracks, shrugged off the pressure of racing at home that has so often caused other top pilots problems. With a greatly improved plane and a year’s experience under his belt, the Canadian ace is looking forward to using the local crowd to his advantage in Windsor again this year. Windsor is also looking forward to hosting the Red Bull Air Race for the second straight year. Ontario’s Minister of Finance Dwight Duncan has been full of praise for the race, which he said gave the region an important economic boost last year. The race in Windsor marks the half-way point of the 2010 season. The next stop is New York on June 19/20. The world championship then shifts to Europe for the final three races in Germany, Hungary and Portugal.